The last days of August saw Hurricane Earl come and go from Antigua. Up to 65 knots of wind was reported with close to 7 inches of rain in only a few hours. 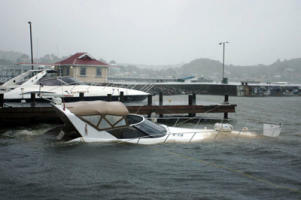 Jolly Harbour Marina reported no damage with 170 boats safely secured ashore and 40 boats tied to the docks in the marina. English and Falmouth Harbours also seem to have fared well with virtually no damage to report. With the centre of Earl passing north of Antigua, the wind direction started in the north and moved via the west to the south. Had the centre of the storm passed to the south of the island, winds would have started in the north and shifted via the east to the south. These variations in wind direction will always apply depending on whether the centre of the storm passes to the north or to the south and it is important to know when planning where to hide. St. John’s Harbour, for example, is not the place to be in a westerly storm like Earl. When hurricane Janet hit in the 1950s, fishing boats ended up in front of the post office on Long Street. More recently, Hurricane Earl was responsible for the sinking of at least one boat in St. John’s Harbour. Starting in the north and moving clockwise around the island, here are some more hurricane holes. In North Sound, just south of the US radar dish, there is a shallow horseshoe-shaped bay that gives protection from most wind directions (170 08’ 09” N; 610 46’ 42” W). Tuck into the eastern corner, use good anchor gear and tie plenty of lines to the mangroves. This bay is only suitable for shallow draft boats. Parham Harbour gives good protection from northerly, easterly and southerly winds but anchor holding is not great and in the ultimate storm this is not the place to be. However, in the southeast corner of Parham Harbour is a mangrove creek that provides superb protection for shallow draft boats (17⁰ 06’ 43” N; 61⁰ 45’ 38” W). The shallowest spot is at the entrance where depths may go as low as 5 feet. This is where the Parham fishing fleet will go to hide when the storm hits. Indian Town Creek, otherwise known as Dian Bay, is located just north of Devil’s Bridge (17⁰ 05’ 54” N; 61⁰ 41’ 09” W) and is well protected from winds from all directions. The entrance is tricky and should only be navigated in good light and before the seas get too rough. Once inside the harbour, the water depth will go down to 6 feet, but further in one can anchor in 9 to 10 feet of water with a clean sandy bottom and superb holding! Emerald Cove in Nonsuch Bay is where all the fishing boats in this area will go to hide. Tie up to the mangroves in the bay as far east as you can get (17⁰ 05’ 05” N; 61⁰ 41’ 20” W). Since all storms finish by blowing from the south, only this most easterly spot will provide the protection needed. And last but not least, Indian Creek (17⁰ 00’ 12” N; 61⁰ 44’ 17” W) is a superbly protected harbour and suitable for most boats. With English Harbour located just around the corner, you may have this hiding spot all to yourself. Wherever you choose to hide from the storm, check your charts and navigation instruments carefully before proceeding to any anchorage. Good luck and let’s hope that Igor, Julia, Karl and the rest will pass us by! Article written by Hans Lammers.